Ian has been painting since 1970. In the 1980’s and 1990’s he painted portraits to commission and began writing instructional books and illustrating books on art techniques including The Instant Artist, Collins & Brown. 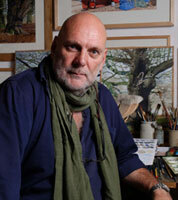 He is currently concentrating on the landscape in the UK and abroad working in watercolours, acrylics and oils. He regularly exhibits in London including the Royal Watercolour Society, Royal Institute of Painters in Watercolour, Royal Society of British Artists, the Pastel Society, the Royal Institute of Oil Painters. Ian taught in summer school in Italy for several years. Ian is a great teacher and has led painting holiday to Venice for us.